Hair Dryers. I'll freely admit, once in a while I use one. Can't help it....growing up in the late 60's, 70's and early 80's made it mandatory. Especially the 70's! Folks with long hair seem to require the use of one more often that their short hair counterparts. Many people with significant others find themselves in the position of needing to make sure that a hair dryer will work in their RV's no matter where they are. I am NOT pointing fingers here....but you all know who you are! I'm glad to inform you that not only is it possible, it's even easy to accommodate the use of a hair dryer in an RV with or without hookups. No, really. 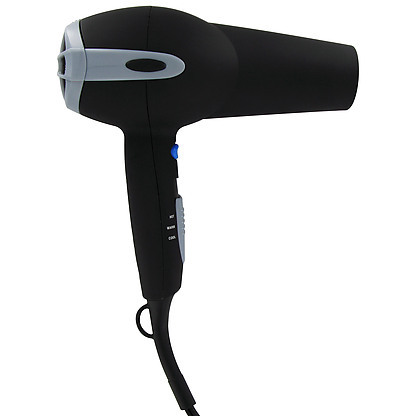 Most hair dryers require lots of power to operate. I've seen ones that use 1875 Watts of power! That's a little over 15 AMPS at 120V. Wow! If you RV has 30 Amp service, that's half of your power going to the hair dryer. If you have anything else on that requires serious power or a bunch of little things, there is a good chance the main circuit breaker will pop or a fuse will blow. Things like 1500 Watt electric heaters or the microwave are the usual culprits, but the hot water heater running on 120V electric can be a power hog as well. The big Watt versions will also take up much more storage space. You can easily find one that has a reasonable amount of Watts and folds quite compactly. The last thing you want is the Hair dryer to quit working just when someone is using it to "make themselves presentable." Believe me, I know this to be true. Well, the easiest solution is to make sure the hair dryer is the ONLY large draw device that's on. The other choice? Get a lower wattage hair dryer. Yes, I know that sometimes this is out of the question, but the smaller ones do work quite well. Yes, they will take a bit more time to dry hair, but it's a relatively easy substitution. Though I wouldn't recommend it without first speaking to all the serious hair dryer users on board. What about when Boondocking? Hmmm You could run the generator for as long as you need the hair dryer running. That really seems wasteful. Make sure you have enough power from the generator!!! Some smaller ones are only 3000 Watts and the tiny portable ones can be as low as 800 Watts continuous power output. What about the times you simply don't have or don't want to run the generator? Since I installed a solar charging system, I hate running my generator. I will, if I absolutely have to, but I'm not all that happy about it. What can you do? Run the Hair Dryer on 12 V power. I'm not talking about using an inverter. Though you could if the draw was low enough. I'm talking about a 12 V version of the hair dryer. There are Several around and they really do work. I know they aren't as powerful as a full blown (pun intended) 120 V version, but if you absolutely MUST have the use of a hair dryer...it works. It will draw about 12 Amps at 12 Volts, so once your batteries are fully charged and you have sun left over, you could run it for a very long time. I generate around 40 amps with my panels, so that's not too much of an issue. be VERY careful running it when your batteries are low and you have no sun. If you have a smaller battery or two, it could really draw them down quickly! In order to maintain hair harmony.....for those that understand.....this article will be an especially helpful bit of news. For you others.....if you want a new hair style...maybe now is the time to try it! Many of the small folding travel hair dryers (like mine) have a tiny button on them that will allow you to set the dryer so it will only run on low heat. You will need a flat screwdriver to turn it. This is great for when the HI setting is too much. You won't accidentally trip a breaker and LO heat is better for your hair anyway. That is GREAT info. I checked mine...no switch, but I would encourage anyone who has a small hair dryer to check. Could save you some grief!